COMPASSIONATE CLIMATE ACTION: 41 Days - Happy World GO VEGAN Week! Who knew? 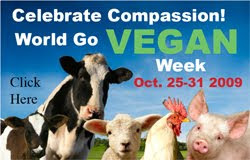 It's World Go Vegan Week (October 25 to 31), and it will end with World Vegan Day on November 1st. Thailand does it. A vegetarian festival every autumn, where the whole country goes veg for a week. Now it's our turn. "This week is a celebration of compassion and a time to take action for animals, the environment and everyone’s well-being. We encourage people to use this week to educate their community about the vegan lifestyle as a compassionate, sustainable, and healthy way of eating and living." Supporter and spokesperson Woody Harrelson says he chose to be vegan initially as an energetic pursuit, as meat and dairy slowed him down, but has since become convinced that it is "not only the most healthy way to live, but also the most compassionate and ecologically responsible way." The timing is excellent for me, considering my recent efforts to try to convince my animal rights activist friends to apply their com/passion and energy to the climate change emergency issue. It's a natural fit, since a veg diet is the easiest way to reduce personal and societal greenhouse gas emissions quickly, especially methane. Indeed the IDA urges people "to recognize the effects their actions have on the world, and our ability to actually avert some impending disasters such as global warming." The IDA website has a list of things you can do to celebrate World Go Vegan Week (host a vegan potluck, ask local restaurants to feature their vegan offerings, write a letter to the editor of a local newspaper, for example). Check them out. For an excellent explanation of all the benefits of a vegan diet, watch the 11-minute movie Vegan. For the People. For the Planet. For the Animals. And here's a link for some great vegan recipes, in case you don't know how to get started. And if your friends or relatives freak out about what they're going to serve you when you visit, tell them it's simple: spaghetti and tomato sauce, hold the cheese. And then ask them to watch the movie with you. Going veg is a gift to the future. Let's do it, folks. Let's give the future this chance at, well, a future! Make the transition all at once or gradually, calling it by another name, eating fake meat (oh yes, delicious and available in Asian health food stores, etc.) or any way that makes it possible to do it. I remember tricking my family a few times (serving "chicken stew" with tofu instead of chicken, for example), and they were shocked at how yummy the meal was. Make sure your breakfasts are veg, and then your lunches, and then your dinners. Or start with one day per week and work up to seven. And if it's true that we are what we eat, then how can we be compassionate if we're contributing to the deaths of 56 billion animals around the world every year ... three million every hour in the USA alone?